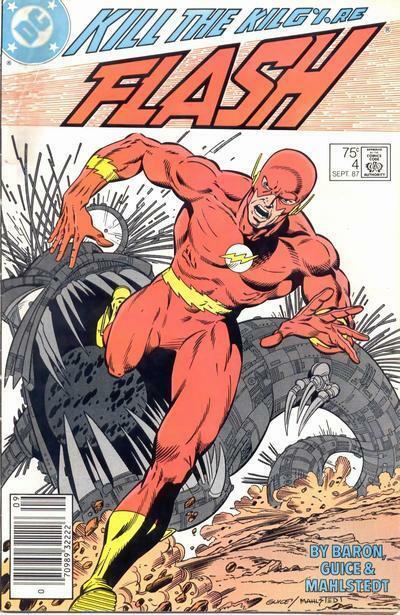 This issue continues the events of Flash #3. The Flash, Professor Schmitz, Tina, and the National Security Advisor speak with the president via video satellite, only to be cut short by Kilg%re. Kilg%re creates a robot machine from the metal in the room that attacks the group. One of the National Security Guard is killed and Flash beats the robot when Kilg%re cuts off all power to the city. Flash tells Tina about his suspicion that Prof. Schmitz is actually a clone that Kilg%re created from the finger of the real Schmitz. Flash tells Tina and the National Security Guard that he is going to go to Cyborg to see if he can help. Tina, who is married in a relationship that is about to fall through, makes out with Flash just as he leaves for Cyborg. Flash eventually gets to New York City and all the power is out there too. There is chaos going on in the streets which Flash doesn’t have time to deal with. He finds Cyborg and bounces off ideas with him. Note that anything that requires electricity that Wally or Vic do is powered by the TT Comsat which is solar powered. They decide that they will have to cut all the power in the world to get rid of Kilg%re, which is considered impossible. They conclude that it’s the only way, and they are worried that the Russians will never agree. After Flash takes a little nap (12 hours) Wally and Vic fly out to Utah to check out the silver dome that Kilg%re left behind there… sort of like a shed skin of a snake. The NSA figures out its hollow and light but wait for Flash and Cyborg to get there to see what’s under it. What’s inside is both amazing and scary to Vic and Wally. It’s a cloning chamber, just as Flash feared. 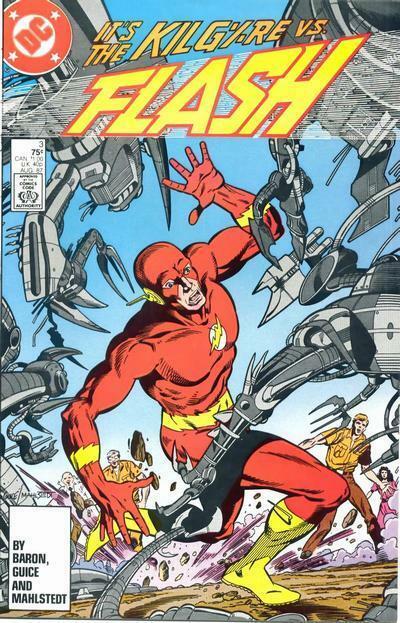 The inside starts attacking Flash and Cyborg, so they leave. They explain to the NSA that what’s in there is off limits and infectious. When they ask what to tell the president, Flash says that it’s communist propaganda. That night, Flash sleeps with Tina and they discuss what Flash saw. After a morning meeting, they all move out to the desert so that Kilg%re can’t use the facility at S.T.A.R. against them. In the car, Vic tells Wally that ‘Schmitz’ has as much metal in him as Vic does; only it’s the alien technology that was in the dome which had the cloning material inside. They get to their temporary place and Cyborg sends a message to all nations in the world to turn off their power. ‘Schmitz’ jumps out of the room and runs at superhuman speed to ‘a tentacle of some monstrous mechanical octopus’ which is trying to get to ‘Schmitz’. Flash gets the robot professor out of the way just in time and the Kilg%re is finally finished. I had a good time reading this issue. A good not rushed way to end this arc, and sort of realistic. The only problem is the fact that they were able to shutdown all the power in the world, which I don’t think would occur so easily. It ends with the Flash going to bed with Tina, which definitely makes me want to read the next issue to see what happens between Wally, Tina, and Tina’s husband. Writing: Five out of five stars. No problems. Art: Five out of five stars. Same thing as writing, no problems. No scan today, nothing really scan-worthy. What a cool review. Thanks for posting this. The Flash remains one of my favorite of the DC heroes.